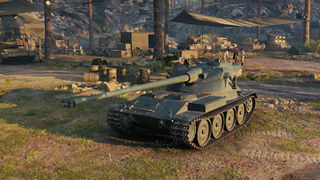 The Bat.-Châtillon 25 t AP is a French tier 9 medium tank. In 1950–1951, engineers of the FAMH company (Compagnie des forges et aciéries de la marine et d'Homécourt) worked on the development of a medium tank with a 90-mm gun and a rotating turret. Work was discontinued at the preliminary design stage. Later, all elements of the vehicle were incorporated in the Batignolles-Châtillon 25 t tank. Replaced Lorraine 40 t in 9.15.1 patch. This tank was called "S*itChat" as it was a less powerful version of BatChat 25t. 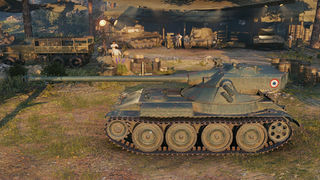 This tank can played as scout or played as damage dealer. Unfortunately its inaccurate, slow-loading gun (Even by Autoloader standards). The Bat.-Châtillon 25 t AP leads to the Bat.-Châtillon 25 t.
You are extremely fragile. Everything can pen you even with HE and in addition your modules tend to get destroyed a lot. Most of all your engine gets crippled from frontal shots. So brawling is quite dangerous to say the least. Staying cautious is the way to go so more or less just pretend you are still driving a light tank. Trying to master this tank is all about knowing when to engage and even more so when NOT to engage. However even when not directly taking part in the fighting you can still contribute to your teams victory. You can easily manage to get some initial spots at the start of the match but most often you will be unable to put shots into the targets you just lit up since you have not yet finished loading your clip. Passive scouting for some time can be profitable too for you can hide in quite a lot of bushes with your ultra low profile and occasionally snipe red tanks once the opportunity arises. But be aware that, however tempting it may seem, sniping shouldn´t too much be relied upon. You will find that you waste many of your precious shots when shooting from far distances due to long aim time, subpar accuracy and slow shell travel speed. YOU DO NOT WANT TO WASTE YOUR SHOTS. Often you will see your team evaporate while you are still stuck on the agonizing 40+ sec reload. And you only carry 42 shells to begin with so running out of rounds is a very realistic scenario. As always joining up with other meds for wolfpacking is viable but still remember to stay out of focus because enemies will always go for the sure penetration on the autoloading french tank. Furthermore you can go for flanking maneuvers in a surprising high number of situations. The great camo value in combination with your tiny stature and blistering speed should enable you to get into advantagous positions and out of trouble again when you are busy reloading your clip. Alternatively, as a last resort, you can just join an already existing close range brawl and give your teammates the edge in firepower in that situation by using brute force. After all you still carry that tremendous 1,8k clip potential. But keep in mind that this method might result in sudden death if things go south. 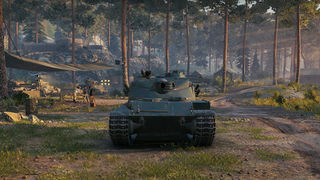 And like with all autoloaders in the game your tank truly starts to shine in the later stages of the match when you are able to hammer away at isolated tanks. It is not always easy to balance passiveness against aggressiveness. This can be frustrating at times but when you do it right and dont lose situational awareness this tank is such a blast to play. This page was last modified on 30 March 2019, at 18:08. This page has been accessed 38,482 times.